British diesel engine innovator, Cox Powertrain, has named Florida based Sun Power Diesel as the latest US distributor of its revolutionary CXO300 diesel outboard engine. Based in one of Cox Powertrain’s primary target regions on the US’s south-eastern seaboard, Sun Power Diesel will play a major role in driving sales of the high powered, low weight diesel outboard in this popular area for recreational boat owners and sports fishermen. Commenting, Sun Power Diesel’s CEO, Jay Davis said, “About once every ten years, a truly game changing product is introduced into the marine propulsion market place. We feel very fortunate to be involved with this decade’s contribution. Our enthusiasm applies not only to the product itself but also to the team that Cox Powertrain have put together. South Florida’s marine industry minutes from Fort Lauderdale airport and is a magnet for recreational boat owners and sports fisherman. 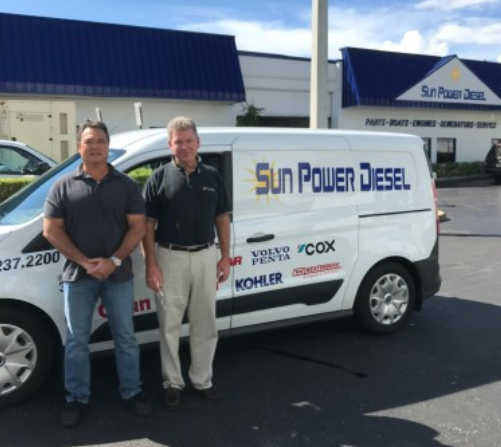 Joining Sun Power Diesel as Business Development and Sales Manager heading the Cox engine program is Dean Gualillo, whose background in the marine propulsion business spans over thirty five years with specific expertise in the marine engine and running gear segments of the industry. Mr. Gualillo will be primarily responsible for all OEM and dealer network development in the state of Florida. Sun Power Diesel will join forces with Cox Powertrain’s US network to present a full size model of the CXO300 to visitors of the Fort Lauderdale Boat Show, November 1-5, Bahia Mar/Hall Of Fame/Las Olas Marina Show 2017, Yellow Zone Land booth 1077-1078.